Against the odds of the current political moment, California is moving ahead with plans to electrify its Caltrain commuter train system in the northern part of the state. The organization in charge of the upgrades needs help choosing graphics for the new fleet of electric trains. Caltrain, a regional commuter rail serving San Francisco and its environs, has seen daily ridership double to 65,000 since 2005, according to a project website. The transit authority is aiming to transition from its current fleet of diesel-fueled locomotives to next-generation Electric Multiple Unit (EMU) trains that not only run on electric power, but are propelled along their length, instead of pushed or pulled like traditional trains. The all-car propulsion technology has been shown to shorten overall trip times, a byproduct of the smoother acceleration and stopping capabilities possible when each car is independently-propelled. The electrification of the Caltrain system will also help lay the groundwork for California’s beleaguered and over-budget high-speed rail line (HSR). The multi-phase HSR network is still on-track for the 2025 debut of the Silicon Valley to the Central Valley line and will also run on electricity. 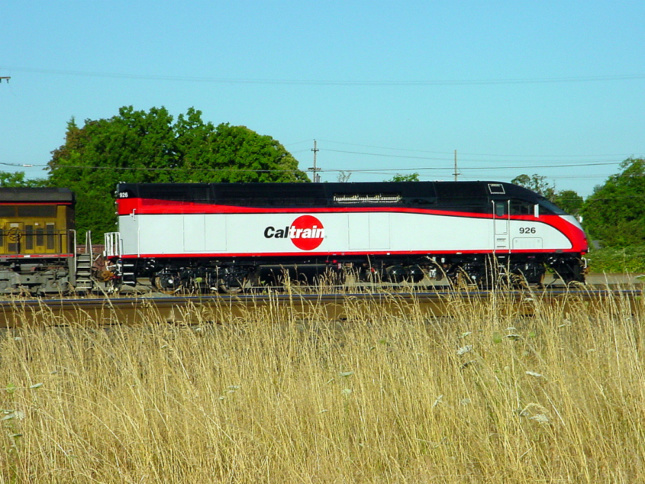 Converting the Caltrain system to electrical power now is a basic requirement for the high-speed rail line’s later operation. Like the HSR itself, the effort to electrify the Caltrain system, however, will not be cheap: Cost estimates for the upgrades are currently estimated to bet roughly $1.3 billion, a large chunk of which will need to come from the now-recalcitrant federal government. President Trump’s budget proposal left funding for the improvements unmet, along with several other major mass transit infrastructure projects across the country like Los Angeles’s Purple Line and New York City’s 2nd Avenue Subway extensions. A recently-released congressional draft budget proposal, however, allocated some $100 million toward the electrification project (and partial funding for the other projects, as well). Either way, Caltrain is moving ahead with purchasing 96 new train cars that would be configured into 16 six-car trainsets. The authority also has the option to purchase an additional 96 cars to be configured variously at a later date, according to a bulletin issued by Caltrain. 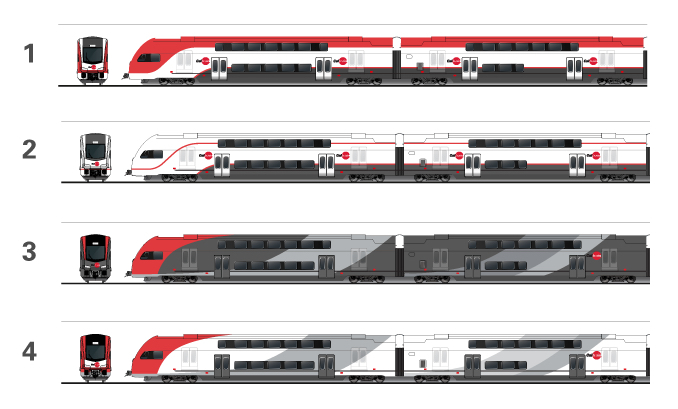 The proposed graphics schemes envision four potential options for the fleet, all of which employ Caltrain’s signature red, white, and dark gray color schemes. The schemes, which feature a variety of striping and color blocking patterns, can be voted on at the Caltrain website. The train operator will spend the next year and a half collecting design feedback and—funding permitting—expects to debut the new trains in between 2019 and 2021.